The one time of the year where you can be whatever/whoever you want to be is almost here. 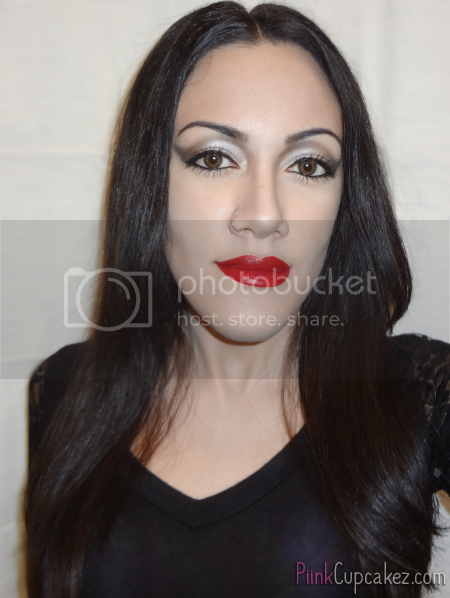 The first look of the month is Morticia Addams because.. well.. who wouldn't want to be her?! Dark and glamorous with a husband who loves her more than anything. Oh, Gomez. Recreating this look made me wonder why I've never had a goth phase in my life. Although, I know I wouldn't have worn it as well as Morticia. All you really need to do for the eyes is create a winged out smokey eye but with less blending. 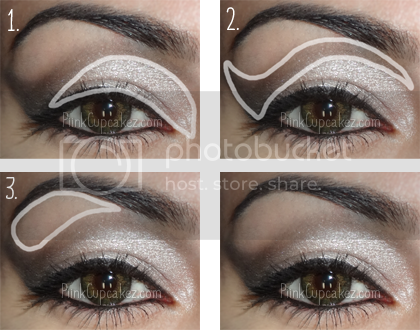 Apply a silver eyeshadow to the lid. The inner half should extend above your crease. Using a dark matte gray or black shadow, place this right above the silver. The inner half should reach the brow then swoop down and into a wing. You want to blend this lightly so that there are no harsh lines but still have a noticeable separation. Apply a matte white under the brow. Then line your eyes and apply mascara. Morticias has black, curved eyebrows so for this I filled in my brows with a matte black eyeshadow and tried to hide my arch as much as I could. 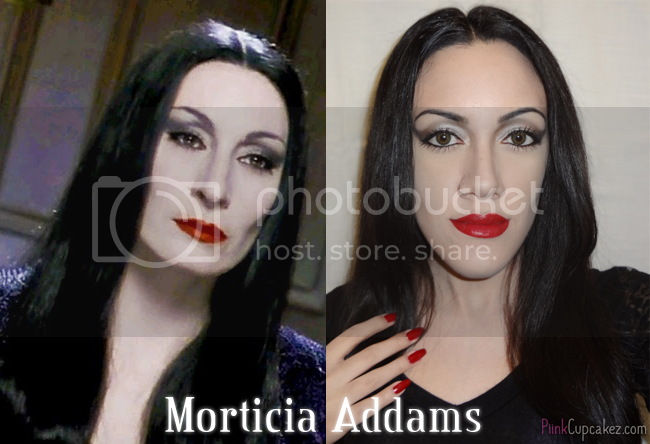 The white face paint that can be found everywhere around this time is too drastic for Morticia. Although she has super pale skin, it's not ghost white. I applied lots of white powder to my face, neck, and hands so that my skin color can still peek through(this took longer than I would have liked and started to look caked on). Instead, I suggest using a lighter foundation and then lightly go over it with a white powder. For contouring, use a dark matte gray eyeshadow or a matte black eyeshadow with a very light hand. Sweep this right under your cheekbones. Once you're about an inch away from the corners of your lips, lightly drag it down and fade it out. Also remember to contour the sides of your nose and connect it to the eyeshadow so that the look flows well. 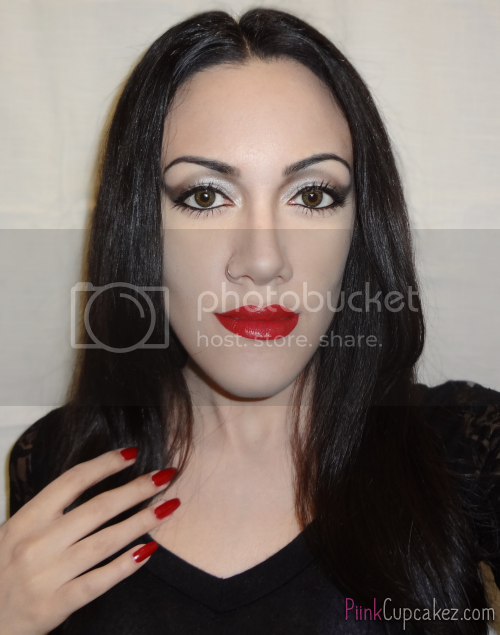 Morticia's red lips and long red nails are part of her seductive look. I used MAC Russian Red on my lips and a darker shade of red on my nails. If you have short nails, I suggest popping on some long red press on's for the night to get the full effect. Those with long dark hair are in luck. All you have to do is part it in the center. But for those who need a wig, just make sure that it's black and has a center part. Hope you enjoyed the look! I have a few more in mind but if you have any suggestions I would love to hear them. I like this. This is my favourite look for halloween. Aww thanks!! So sorry I'm late but I suggest using a light foundation instead and set it with a white powder. Try something like Wet n Wild and NYC since they're inexpensive. It will look a lot better than white face paint.